"They'll print anything these days!" Pierce Brosnan's second stab at Bond is certainly a lot more action intensive than his debut. This was probably a result of the script malfunctions that the film suffered from. The original plot of the film was based in Hong Kong and featured the theft of gold bullion. After a draft by writer Donald Westlake, a script by Daniel Petrie was chosen. But then unhappy at the way some scenes were going, Eon brought screenwriter Bruce Fierstein onto the set to do rewrites as they were filming, much to the annoyance of Jonathan Pryce especially who saw his role completely changed from the one he had signed on to play. I recall at the time of the film's imminent release reading an article about the troubled production with Brosnan lamenting that an earlier "S**t" script cost them having Anthony Hopkins as Carver. The end result is that Tomorrow Never Dies is a game of two halves. The first hour is brash and entertaining with some stylish and inventive Bondian moments whereas the second half of the film is less inspired with a surfeit of increasingly repetitive action to plug the gaps in the story. The PTS of the film is good fun as usual. 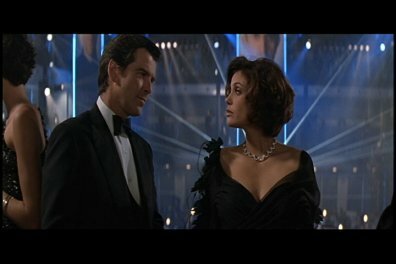 Bond goes undercover at a 'terrorist arms bazaar' on the Russian border and ends up having to pilot a jet loaded with nuclear missiles after the Royal Navy make what could be a costly blunder. This sequence was originally written for The Living Daylights and has a bit of suspense in amongst the explosions and mayhem. Daniel Kleinman's title sequence is quite stylish although Eon made a blunder (as usual!) with the song by picking Sheryl Crow's ho-hum 'Tomorrow Never Dies' as the main theme and relegating KD Lang's vastly superior 'Surrender' to the end credits. There is some great stuff in the first half of the film especially. I love the sequences where Brosnan sneeks into Carver's newspaper headquarters (to pilfer a GPS 'encoder' no less). David Arnold does a good job with some brassy Bond cues and techno beats as Bond cracks a safe and ends up in all manner of mayhem with gun fights, a punch-out above a printing press and a few one-liners. These sequences are Brosnan at his best. Suave, dashing, physical and witty. In the film Bond teams up with Chinese agent Wai Lin (Michelle Yeoh) to investigate Carver and I love the bit where Wai Lin starts walking up the wall of Carver's newspaper HQ with a special rope gadget. The look on Brosnan's face is priceless and very funny. Perhaps the best action sequence in the film is the gadget-laden BMW chase where Bond controls his car via a mobile telephone in the back seat as it races up a multi-storey car park dodging traps and rocket launchers. THe BMW is equipped with numerous gadgets and this scene makes up for the lack of nifty car gadget action in GoldenEye. Brosnan looks like he's having great fun here, note his look of delight when he reinflates a burst tyre. There is also a good bit with Vincent Schiavelli as Dr. Kaufman, an eccentric hitman working for Carver. "Believe me, Mr. Bond, I could shoot you from Stuttgart and still create ze proper effect." Schiavelli and Brosnan do some nice work here in an amusing scene. After a 'HALO' (high altitude, low opening) jump from a plane into the sea and a well staged motorbike chase on the streets of Saigon, the film eventually becomes bogged down into a generic action climax on Carver's stealth boat. While always entertaining, it's a shame that the film couldn't have been wrapped up in a more inspired way or managed to sustain some of the excellence that marks the first hour. 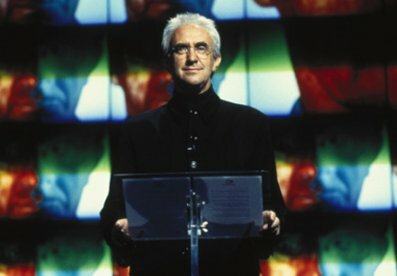 What of the cast in Tomorrow Never Dies? Well, Brosnan is very good, especially in the first hour, and cements himself in the role. He's able to make you laugh and also fairly cold-blooded at times. It's a shame that the actor never quite got a script from Eon that was worthy of his 007. Jonathan Pryce, while hamming it up to reasonably enjoyable effect, is not the best villain the series has seen and his character never really comes off as classic or very well defined. He's obviously influenced by a number of real people - Rupert Murdoch, Robert Maxwell, even a bit of Bill Gates. His scheme and the resulting script revelations don't make much sense. Why would Carver want exclusive rights to China? He's rich anyway and knocking on a bit. Why would the Royal Navy send the 'fleet' to China? Answers on a postcard. Pryce is at his best in the film snapping out mildly funny lines like "Mr Stamper, will you please kill those bastards!". Michelle Yeoh is always likeable but she's never quite used to her full capabilities in the film. 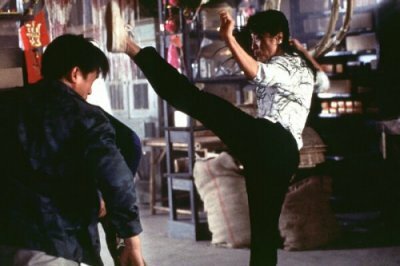 When she finally gets to kick a few heavies in the face and karate chop someone it comes off as a diluted imitation of the sort of stuff she's done in Hong Kong films. Teri Hatcher is not very memorable as Paris Carver. I didn't really care what happened to her although the script tries to make you. Apparently imposed on Eon by the studio because she was popular through (and a lot more memorable and likeable in) the 'Lois & Clark' television show of the time, her role is rumoured to have been cut back after test screenings. "This job of yours... it's murder on relationships," she says to Bond and with dialogue like that you can't blame her for looking uninterested. David Arnold's cheesy overscored music doesn't help in these more down to earth moments although the composer does a good job elsewhere and adds some punch and spark to the film overall. I did like Götz Otto as Mr Stamper though, not a bad 'henchman' at all. "I owe you an unpleasant death, Mr Bond" he says and I for one always get a kick out a villain saying 'Mr Bond'. Ricky Jay as Henry Gupta and Vincent Schiavelli, who I've already mentioned, are also very good. Series regulars M, Moneypenny and Q also return in the film. Samantha Bond is saddled with some terrible double entendres as Moneypenny but she's ok. Judi Dench is not really my cup of tea as M but I felt she always worked quite well with Brosnan. It's also fun to see her briefly sparring with her sitcom co-star Geoffrey Palmer who plays a stuffy gung-ho Admiral in the PTS. The great Desmond Llewelyn, who Brosnan palpably enjoys bantering with, supplies a few welcome laughs as Q ("You have a licence to kill - not break the traffic laws!") and Joe Don Baker returns as Jack Wade, Bond's CIA contact. Director Roger Spottiswoode actually does a very good job overall. Some of the more boisterous action sequences have a bit of sweep and invention that more than match the other Brosnan films and Spottiswoode can be commended for delivering an entertaining film despite the problems that surrounded the production. I wouldn't have minded him having another crack at James Bond with a better script and story. So, the first half of Tomorrow Never Dies is great fun with some great moments. At some point it becomes a bit more familiar and doesn't doesn't suprise you a great deal. I don't like James Bond to be too generic and they move into this area for me when Brosnan runs around firing machine guns at the end. It does look like they struggled to come up with a good ending, a common complaint of James Bond films since GoldenEye. 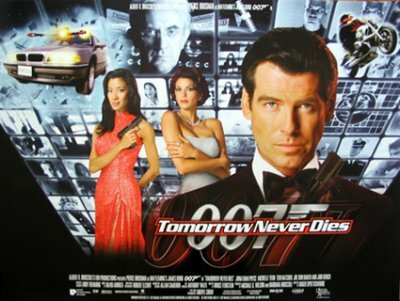 That said, Tomorrow Never Dies rattles along at a good pace and is never less than entertaining with some great stunts, chases and a scattering of good laughs. Not classic Bond but fun nonetheless.